As expected, it rained on Tuesday. A lot. Some dramatic flooding occurred in New Jersey. From Bergen/Hudson counties in the northeast, to Monmouth County at the Shore, to the I-295 corridor, intense rain and rapidly rising water made for a tough evening commute. And then, just as the sun set on a busy weather day, a quick tornado likely spun up in rural Burlington County. It is rare to have such a prominent tornado signature on radar in New Jersey, but there it was. Because that area of the Pine Barrens is so barren, I highly doubt we'll get a storm survey and/or tornado confirmation. We've got another day of active weather Wednesday. But it's not going to rain all day. And our threat for truly severe weather is going to be limited. Wednesday morning is kicking off with some leftover spotty showers and patchy fog. Frankly, most of the day looks dry. As we clear away to partly sunny skies, you'll certainly notice how warm and humid it is — quite summerlike! High temperatures should soar into the lower to mid 80s. Autumn weather is all about strong cold fronts, and we've got one aiming for New Jersey. Our attention will turn sharply to the northwestern sky starting around Wednesday mid-afternoon, as a line of thunderstorms approaches. Initial raindrops could arrive as early as 3 p.m., but for most of the state rain won't arrive until Wednesday evening. Given the heat and humidity, these storms will probably be strong or severe when they first arrive — our main concerns will be gusty winds (60+ mph) and heavy rain (leading to flash flooding). But, as usual, the life of any severe thunderstorms will be limited by daylight. Once the sun goes down — around 6:50 p.m. — temperatures will start to cool, the atmosphere will stabilize, and thunderstorms should quickly fizzle to showers. 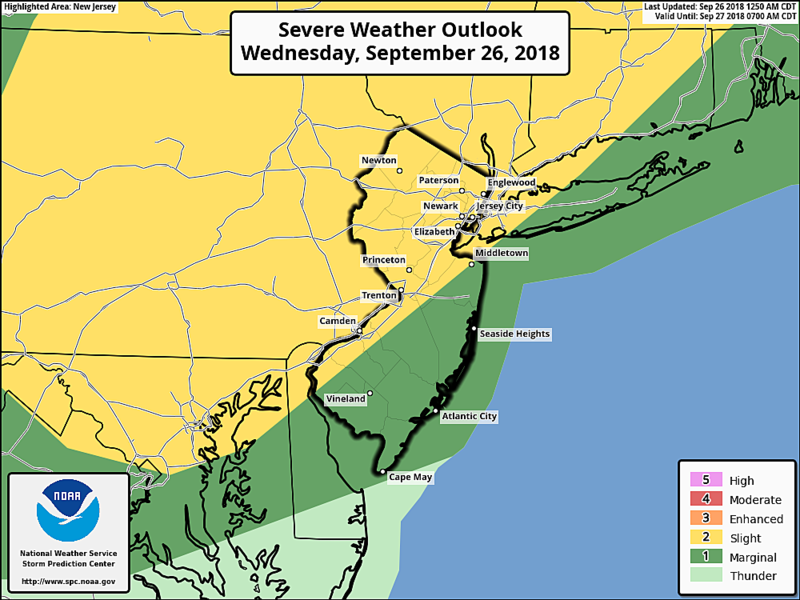 I think the Storm Prediction Center's severe weather outlook is well-placed — if you live in the "yellow" area of that map, be prepared for a brief period of nasty weather Wednesday evening. Beyond Wednesday, our forecast has actually trended a bit wetter. But I promise — we'll get to enjoy some fantastic autumn weather by week's end! Light to moderate rain may linger for a bit Wednesday night, as skies remain cloudy. It will be cooler and noticeably less humid, with low temperatures dipping to around the 60 degree mark by Thursday morning. Yes, the chance for showers will continue throughout Thursday, especially in South Jersey and along the coast. Regardless of raindrops, the day will be mostly cloudy with high temps limited to the upper 60 to around 70. That's a bit below normal for late September. Models suggest one more round of statewide showers for Friday morning, before we finally start to clear out and dry out. I suspect clouds will still win the sky until very late-day Friday. Thermometers hold steady around 70 degrees. And then, the weekend. Sunny. Dry. Pleasant. The temperature forecast has trended downward, but lower to mid 70s will still be seasonable and comfortable. It will be nice to end the month of September with a reminder that the sun is still up there somewhere. The long-term outlook shows warming temperatures early next week, with 80s a good possibility. Next chance of rain will be late Tuesday-early Wednesday. Our next strong cold front — likely around next weekend — could spark our first frost of the season (below 37 degrees) in North Jersey.